“Psy-Fi”,a cutting edge festival in a large park held every year during August in Leeuwarden near City of Water “Amsterdam – Netherlands”. Festival attracts many party freaks,many travel across europe to participate in this festival at the end of europian summer season. 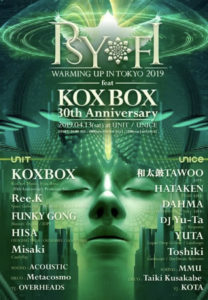 Once again this year Psy-Fi Warming Up in Tokyo will be coming to Tokyo for the forth time on Saturday 13th Apr,Daikanyama UNIT / UNICE ! Ree.K – will play special Goa Trance Set. She is running at the front line of the scene,consecutive release of musics,interviews,and further special program at Dommune. DJ HISA,DJ Misaki, The long-awaited next generation of psychedelic trance music scene. DAHMA(Reo Matsumoto and Nory)– Alternative Duo whose name is now reached throughout the country. DJ Yu-Ta (Turntablist from Zipang)builds the breadth of songs backed up by many years of career and the outstanding excellent skill as weapons.